The crystallization and melting of polyethylene-like copolymer systems with co-units placed at the same equal distance along the backbone are reviewed on the basis of available thermal and structural data for a large variety of pendant and backbone-inserted groups. Data for a series of precision halogen-containing polyethylenes are used to describe the effect of size of the pendant group and the distance between groups along the backbone on crystallization and melting behaviors. 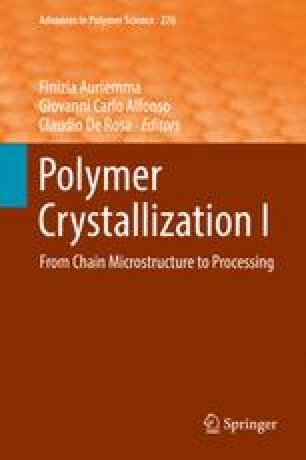 The effect of crystallization kinetics on polymorphism observed for systems with co-crystallizable co-units is emphasized with data on polyethylenes containing Cl and Br. The major characterization techniques for identifying different modes of packing are also described. The melting behavior of alkyl-branched precision polyethylenes is analyzed in reference to branch partitioning between crystalline and non-crystalline regions, and also in reference to the behavior of analog polyethylenes containing halogens. Furthermore, the effect of interacting functional groups and tacticity on self-assembly and melting is analyzed using available literature data. This material is based upon work supported by the National Science Foundation under grant no. DMR1105129. Any opinions, findings, conclusions, or recommendations expressed in this material are those of the author(s) and do not necessarily reflect the views of the National Science Foundation. We remain grateful to Prof. Wagener and E. Boz who kindly gave us the precision halogenated systems for study of their crystallization behavior. LSB acknowledges a postdoctoral fellowship APOSTD/2013/036 supported by the Generalitat Valenciana and the Universitat Politècnica de Valencia, Spain.